KIEV, Ukraine -- Under the attentive eye of Russian state television, several hundred pro-Russian demonstrators in the city of Donetsk, in eastern Ukraine, declared on Monday that they were forming an independent republic and urged President Vladimir V. Putin to send troops to the region as a peacekeeping force, even though there was no imminent threat to peace. The actions in Donetsk and two other main cities in eastern Ukraine, which included demands for a referendum on seceding from Ukraine and joining Russia, seemed an effort by the activists to mimic some of the events that preceded Russia’s invasion and annexation of Crimea. However, there were no immediate indications that the Kremlin was receptive to the pleas. While widely regarded as political theater supported if not directed by the Kremlin, the protests could help promote what analysts say is Russia’s primary goal of destabilizing the shaky government in Kiev, preventing it from drifting further into the West’s orbit and giving Moscow leverage over the country’s future ahead of presidential elections in May. The turmoil in eastern Ukraine also makes it extremely difficult for the provisional government in Kiev to begin putting in place an array of austerity measures and financial overhauls required by the International Monetary Fund as a condition for an $18 billion loan package that the country desperately needs to avert a financial default. The protesters themselves may be trying to provoke a violent response from Kiev, analysts say, hoping to provide the pretext for a Crimea-like military incursion in a country that Moscow considers an integral part of historical Russia. The Ukrainian authorities seemed to be responding cautiously, but made several enforcement efforts throughout Monday night. In Kharkiv, they expelled demonstrators from the regional administration building, which was then briefly set ablaze as protesters threw firebombs. The first was extinguished, but at least two people were injured in clashes with the police outside the building, local news agencies reported. 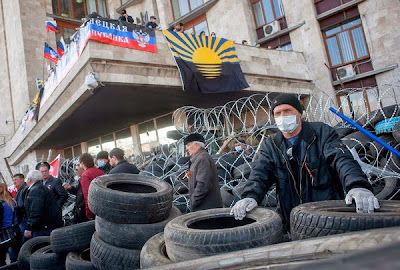 In Donetsk, the authorities were able to retake control of the headquarters of the security services, but remained in a standoff with demonstrators occupying the regional administration building. Several thousand people remained on the streets early Tuesday morning, and tension remained high across the region, with a continuing risk of violence. In recognition of the potential dangers, Secretary of State John Kerry told the Russian foreign minister, Sergey V. Lavrov, in a phone call on Monday that there would be “further costs” if Russia took additional steps to destabilize Ukraine, the State Department said. Mr. Kerry said in the call that the United States was monitoring with growing concern the pro-Russia protests in Donetsk, Kharkiv, Luhansk and Mariupol, and did not believe they were a “spontaneous set of events,” said Jen Psaki, the State Department spokeswoman. “He noted in particular the recent arrests of Russian intelligence operatives working in Ukraine,” Ms. Psaki added. The Obama administration has warned Russia that it is prepared to impose additional sanctions if Russia intervenes militarily or covertly to undermine the new Ukrainian government, a point Mr. Kerry repeated on Monday. “He made clear that any further Russian effort to destabilize Ukraine will incur further costs for Russia,” Ms. Psaki said without providing details. Officials from the United States, Russia, Ukraine and the European Union are planning to meet in the next 10 days to discuss the situation in Ukraine, Ms. Psaki said. NATO’s top commander, Gen. Philip M. Breedlove, said last week that the approximately 40,000 Russian troops near the Ukrainian border are capable of intervening in eastern Ukraine on 12 hours’ notice and could accomplish their military objectives in three to five days. As the Russian side has noted repeatedly, it is difficult to count on a long-term stabilization of Ukraine without a real constitutional reform within the framework of which, through federalization, the interests of all regions would be ensured, its nonaligned status maintained and the special role of the Russian language reinforced,” the Foreign Ministry said. The Foreign Ministry denied any role in the unrest, even though the demonstrations on Sunday evening in Donetsk, Kharkiv and Luhansk seemed coordinated and bore the hallmarks of similar protests last month that were organized with support from Moscow. “Stop pointing at Russia, blaming it for all the troubles of today’s Ukraine,” the ministry said. The unrest in eastern Ukraine seemed to heighten fears in Kiev and the West about possible Russian military action a little more than a month after Russian forces occupied Crimea. The Kremlin annexed Crimea after a referendum there last month. In Germany, a spokesman for Chancellor Angela Merkel said Monday that the government was extremely concerned about the events in eastern Ukraine and called for calm. “The latest developments in Donetsk and in Kharkiv are something which we are all very worried about in the German government,” the spokesman, Steffen Seibert, said at a news conference. Even as the Kremlin denied any role, government-controlled television stations in Russia gave live coverage to the events in Donetsk on Monday, including the reading of a sort of declaration of independence of the “sovereign state of the Donetsk People’s Republic” by a pro-Russian demonstrator inside the regional administration building. Protesters occupied the building on Sunday. While the demonstrators in Donetsk announced that a ballot referendum on secession from Ukraine would be held no later than May 11, there did not appear to be the same overwhelming support for such a move that there was in Crimea last month. The Donetsk City Council called on the protesters to end their occupation of government buildings and engage in negotiations. “All conflicts should be resolved legally,” the council said in a statement. Aleksei Pushkov, the head of the Foreign Affairs Committee in Russia’s lower house of Parliament, told reporters in Strasbourg, France, that the events in eastern Ukraine showed that the opinions of Russian speakers in Ukraine could not be ignored. “Stability will not be achieved in Ukraine without heeding the wishes of the people who live in the eastern and southern regions of Ukraine, primarily, Russian-speaking people,” Mr. Pushkov said in France, where he was attending a session of the Parliamentary Assembly of the Council of Europe, according to the Interfax news service. The events in the east unfolded just hours after a Ukrainian military officer was shot and killed in Crimea in a confrontation with Russian troops. A spokesman for the Ukrainian Defense Ministry, Vladislav Seleznev, said the officer, Maj. Stanislav Karchevskiy, was killed in a military dormitory where he lived with his wife and two children, next to the Novofedorivka air base in western Crimea. The death of the Ukrainian officer was a rare instance of deadly violence as Ukrainian forces continued their withdrawal from the peninsula after its annexation by Russia. Mr. Seleznev said the Ukrainian soldier had been collecting his belongings in preparation to leave Crimea when an argument broke out with Russian service members, Reuters reported Monday. Mr. Seleznev said that the altercation involved several Ukrainian and Russian soldiers and that there were no other injuries. He said a Russian soldier armed with an automatic weapon entered the dormitory and shot Major Karchevskiy, who was unarmed. With tensions intensifying in the east, the former prime minister, Yulia V. Tymoshenko, who is running for president in elections next month, traveled to the region. At a news conference in Donetsk, Ms. Tymoshenko said she was committed to strengthening the autonomy of Ukraine’s regions, especially by letting them control their finances, but said she opposed federalization. She also said that she did not believe most people in Donetsk supported the protesters. “I got the impression that all of this aggression lives on its own island, separate from the life of Donetsk,” she said.